Flavor: Legit biscuits and gravy! The new and improved flavor is great! My partner and I recently went on a road trip and of course, road trip = snack time!! No good vacation is complete without some fun new snacks! We made a pit stop at our usual halfway point between Portland and Seattle (Centralia, WA), and found a couple of country-flavored chips. 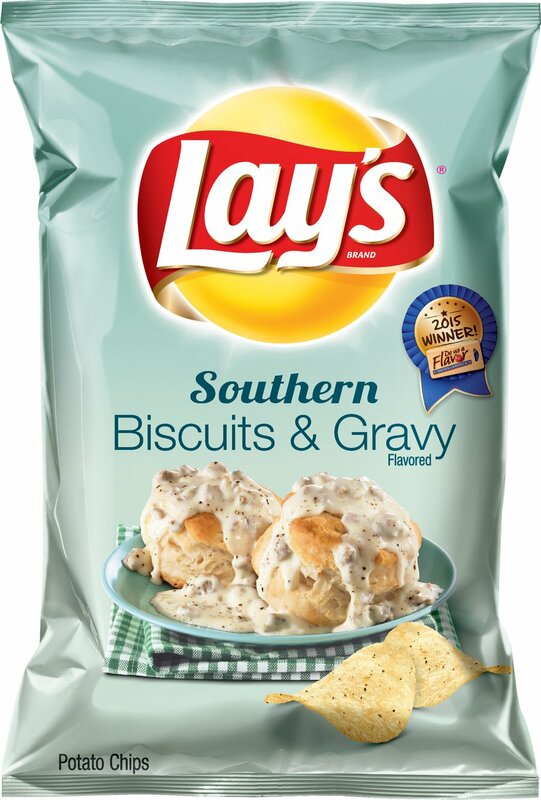 My partner was extremely happy to find that their favorite chips from last summer's Lay's flavor contest had made the cut: Southern Biscuits and Gravy - and to boot, they were now being sold in a small bag! That was a no-brainer for their road snack. 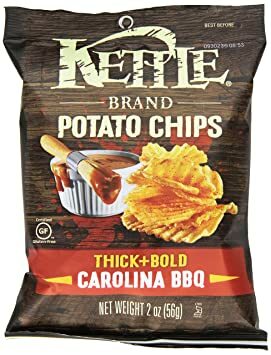 I had a bit more difficulty finding something to snack on, but I finally settled on the new Kettle Thick + Bold Carolina BBQ chips. I don't get BBQ too often because I'm kind of picky and it feels a bit, you know...pedestrian for my refined palette, but what the hey, I was on vacation! I should have listened to my gut and gone with something more adventurous, pun somewhat intended, but that's neither here nor there. First - you might recall that I didn't care too much for the Lay's Do Us A Flavor options this past summer. I felt that the flavors I would have liked were wimpy and sad and the others were just not good. The Biscuits and Gravy, in particular, was a let down because it had a lot of potential and fell very, very flat. But you may now dry your tears, snackfriends, because Lay's has kicked it up several notches in the new batch! Just opening the bag smells like fresh biscuits, and each bite offers a peppery punch that makes you feel like you're back at Bob Evans, tossing down a big ol' plate of sausage gravy smothered biscuits. Thank you, Lay's! Unfortunately, the Kettle Carolina BBQ didn't fare so well. At first, well, let's just say "bold" is not the first word that came to my mind. "Bland," "uninspired," and "odd-in-a-bad-way," perhaps, but definitely not "bold." Perspective is a big thing, so had these chips been marketed as being beanie weenie flavored, I would have been like, "Dang!!! Kettle knows their stuff!! These taste perfect!" However, expecting a mature Carolina BBQ and getting cheap camp food left me sad and disappointed in these. Womp womp. Of all the barbecue chips that I've tried, for some reason, Herr's Baby Back Ribs flavored chips, despite not tasting like ribs, actually has a deep smoky flavor that I'm sure will be found to cause cancer or something because it's just too satisfying. That's how those guys get away with making their weight per bag lower than the other brands, lol.